UPDATE: Here’s the transcript for this #Blogchat! Tonight’s (6-18-2017) #Blogchat will focus on B2B blogging. From past surveys, I’ve found that about half the #Blogchat audience blogs for their employer, and that employer sells to other businesses. 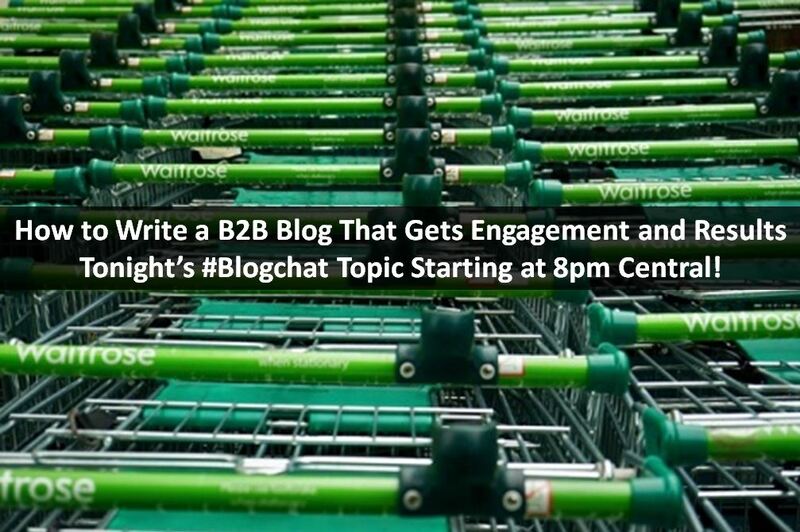 So this should be another very interesting #Blogchat for those of you blogging for a B2B! Blogging for a business is much different from blogging as a hobby or for your personal enjoyment. The goals that an individual has for their personal blog are typically completely different from the goals that a business has for its blog. Tonight we’re going to look at B2B blogging through two lenses: Getting engagement and getting results. To prep for tonight’s #Blogchat discussion, I wanted to take a closer look at how B2B blogs can and should do both. If you’re a personal blogger and you’re writing about your passions, probably the only engagement you care about or even want are comments on your posts, and social shares. This is because you are typically creating content as a way to create or expand a conversation. You want interaction with your readers, you want to share your thoughts and you want them to share their thoughts, with a larger conversation being one of the chief reasons why you blog. Businesses that blog are using their blog as a tool to grow their business. This changes how they measure their efforts and how they blog. So the types of engagement that matter for a personal blogger, may not to a business blog. Here’s an example. When I started blogging back in 2005, I was focused on creating content that drove engagement in the form of comments. Remember this was before Twitter and Facebook at the time wasn’t open to everyone, it was only available to college students. So the idea of ‘social shares’ wasn’t really a focus for engagement, it was all about driving comments. So as a new blogger who was blogging to grow my consulting business, the type of engagement I pushed for was comments. After blogging for a few months, I began to notice that the majority of my new clients weren’t readers that were leaving comments on my blog. Instead, they were people were finding my content from doing google searches. To this day, about 75% of my new clients have never left a comment on my blog. So while comments are still important to me and most B2B bloggers, we often look at other forms of engagement. B2B bloggers often use social media in conjunction with other marketing initiatives. For example, a blog is often used by a B2B business to help drive newsletter subscribers, or to promote downloads of a whitepaper. Then, the B2B will track engagement metrics associated with these. Whereas a personal blogger might track how many comments per post they get or how many Likes on Facebook, a B2B blogger would likely track engagement metrics like the number of new email newsletter signups per week, or the number of white paper downloads per month. In other words, B2B bloggers are trying to acquire customers, so they measure engagement metrics that tie to that goal. What Type of Results Do B2B Blogs Measure? Sales. That’s it. B2B blogs need to help generate sales for the business, and everything it does is measured through this lens. Notice above when discussing engagement, a B2B blog measures engagement metrics that more closely align with sales versus simple interactions with readers. So if a B2B blog’s job is to generate sales, then it must create content that helps support that goal. However, there is an important caveat that B2B bloggers must understand; You can only sell what the reader is ready to buy. What I mean by this is, if you are creating content that sells your product, it will only be receptive to readers that are READY to buy that product. This is where many business bloggers get in trouble, because they want to blog as a way to raise awareness for their business. But raising awareness often conflicts directly with the idea of generating sales IF you aren’t thoughtful about your content strategy. If your content strategy is to create content that raises awareness of your business, that means by default, you are creating content for an audience that doesn’t know who you are (which is why you need to raise your awareness). 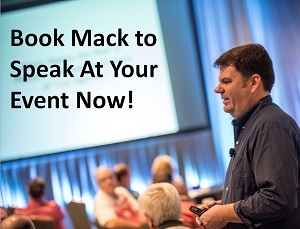 If that audience doesn’t know who you are, they also don’t know why they should do business with you. So if you create content that directly sells to the same audience that doesn’t know who you are, it will most likely fail spectacularly. Instead, your content should be focused more on the potential customer, in order to gain their attention and attraction for your content. After you’ve gained their attention (built awareness), then you can start creating content that more directly sells to them. Here’s an example: In doing a content audit of my blog, I realized that recently, I haven’t been creating enough content to support my consulting services that are focused on helping companies launch and build brand ambassador programs. So I’ve been building out a content calendar of future posts that will focus on connecting with readers that I want to hire me to help them build brand ambassador programs. But this audience is one that doesn’t know who I am, so my content doesn’t need to sell my services directly. Instead, my content will be focused on the customer, it will be educational and instructional, with the goal of helping the customer so that the customer will be open to engaging more with my content and learning more about my consulting services around brand ambassador programs. So for B2B blogs, the result they are seeking is more sales, but you need to understand your audience and craft a content strategy that moves the reader from unaware, to aware, to ready to buy. Check out this post for a deeper dive on this issue from the content strategy side. Whew, that’s a pretty meaty prep post for tonight’s #Blogchat on How to Write a B2B Blog That Gets Engagement And Results! Please do join us tonight on Twitter at 8pm Central. Also, #Blogchat is being sponsored this month by Marketing Profs, who was kind enough to offer #Blogchat a FREE writing toolkit, just click here to get yours, all for free! See you tonight at #Blogchat, you can follow along here on Twitter. I dig the customer focused content note; if you want to generate sales, solve customer problems. Each of my posts solves problems for free then I link into a call to action which solves problems for premium. Ryan that’s a sensible approach, I often do the same thing, give the reader the basic info they need to solve the problem, when they need more help, they can hire me! I think it’s smart to figure out what stage of the funnel your customer is in and create the appropriate content. I know that I’ve been burnt before by not remembering that. Good point, Niel, this is often overlooked by blogging companies. You can only sell what the customer is ready to buy! Amazing tips you shared. Thanks for sharing these wonderful tips with the world.